INTRODUCTION. Handwritten digit recognition has been a major area of research in the field of Optical Character. Recognition (OCR). Based on the input to the. 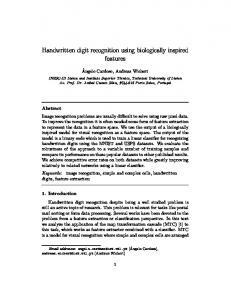 Dec 7, 2018 - In this proposed model, two handwritten digit datasets are used: CVL Single Digit and ... recognition and pattern recognition technologies, the. Cornelius T. Leondes and published by the Academic Press. ... sources include Andrews (1972), Duda and Hart (1973), Tou and Gonzalez (1974), Young. The output of the model is a binary code which is used to train a linear classifier for recognizing ... Email addresses: [email protected] (Ãngelo Cardoso),. 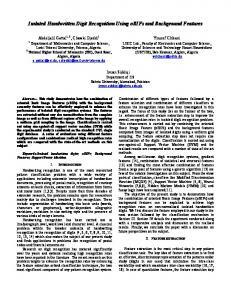 Nov 27, 2012 - Electronic Letters on Computer Vision and Image Analysis 11(1):68-76; 2012. Handwritten Digit Recognition by Fourier-Packet Descriptors. In this paper, a method is proposed to recognize Persian handwritten digits. ..... of Hand printed Characters The state of the Artâ, Proceedings of the IEEE, Vol. Unsupervised Incremental Learning Technique. Dharamveer Sharma. Assistant Professor,. Department of Computer Science, Punjabi. University, Patiala. Jun 10, 2015 - File (PDF). DOI: 10.13140/RG.2.1.2466.0649 Â·Available from: Saeed AL-Mansoori, Jun 10, 2015 ...... Android, Fourth International Conference. 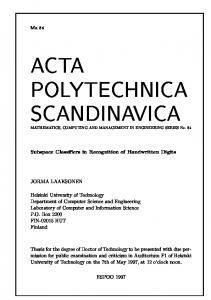 In this article, the task of classifying handwritten digits using a class of multilayer ... using features information, improving the recognition of 2D shapes with a.
Abstract In this paper we describe the preprocessing steps for a contributed digit dataset, going all the way from a physical page of paper – filled out by students – past digital scanning to computerized segmentation, resizing, and blurring. Surprisingly, very little expertise can be transferred from other datasets to our new dataset for a state-of-the-art SVM classifier, although the performance for each separate dataset is acceptable. This may indicate that at least SVM, and possibly also other learners, are sensitive to small changes in preprocessing, emphasizing the need not only to create benchmark datasets for handwritten digit recognition, but also to document their preprocessing as detailed as possible and aim to replicate that as well. Our work is a small step in that direction. 10 rather than more than 64 for lowercase and uppercase characters plus digits and comma, dot, colon etc.. In the process of holding a lecture for students at the Medical University in Vienna, we chose to let students contribute and analyze their own dataset for handwritten digit recognition. An input page was designed on which each student was to write 100 digits, equally distributed among zero to nine. Additionally, each student chose whether to contribute his digits to the public domain, for further experiments by the author under non-disclosure to third parties, or not contribute them at all. 44 students contributed their input pages, and of these 37 contributed them to the public domain. The latter data has been made available at alex.seewald.at/digits, while we continue using the larger full data for our own experiments. We are looking forward to create similarily-sized datasets each year, provided the lecture will continue to take place. Others are cordially invited to contribute as well – all our code is available freely for non-commercial purposes. Just send us a mail so we know what you intend to do with it, and see if we can help. 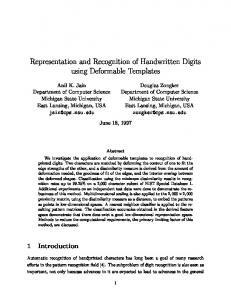 We report preliminary results on our and two other handwritten digit recognition datasets, and were surprised that although the task is always the same, almost no expertise can be transferred between these datsets, even though we followed the known preprocessing steps by the letter and also checked format similarity in other ways. Bitte tragen Sie handschriftlich die Ziffern 0-9 in die entsprechenden Spalten ein. Versuchen Sie nicht, besonders sch¨ on zu schreiben, sondern so wie immer. Jede Ziffer sollte ungef¨ ahr in der Mitte des K¨ astchens sein. Arbeiten Sie z¨ ugig und ruhig in Ihrem gewohnten Tempo. Die Daten werden eingescannt, anonymisiert und digital weiterverarbeitet, und bilden Trainingsdaten f¨ ur die Labor¨ ubung. Sollten Sie aus irgendwelchen Gr¨ unden Beispiele Ihrer Handschrift nicht zur Verf¨ ugung stellen wollen, dann tragen Sie bitte keine Ziffern ein. Ich bin damit einverstanden, daß nach Abschluß der LVA die von mir erstellten Daten: 2 f¨ ur weitere Forschungsprojekte des Lehrveranstaltungsleiter verwendet werden k¨ onnen, allerdings ohne Weitergabe an dritte Personen (¨ aquivalent einem Non-Disclosure Agreement) 2 der Allgemeinheit zur Verf¨ ugung gestellt werden (zB im UCI Data Mining Repository) Zutreffendes bitte ankreuzen! What remains to be done is to extract one sample digit from each cell that is defined by the vertical and horizontal lines of the table, which have already been reconstructed in the last step. We can no longer assume the lines to be perfectly horizontal and vertical. However, this is desirable for an efficient algorithm, so as first step we determined the largest axis-parallel rectangle which fits into the parallelogram given by the 2 In that case, it either was connected to a digit or broken by white speck noise at the midpoint. Figure 3: Left: Horizontal/vertical lines from histograms, Right: Refined via local search and linear regression. has 60,000 training and 10,000 test samples. We have output our digits in this format with Mitchell filter downsampling and again blur=0.5. Center-of-gravity was computed before downsampling and scaled accordingly. Figure 6 shows samples from MNIST and from our reformatted dataset. You can see that MNIST has some segmentation errors (e.g. column 4, row 4 is a badly segmented four), possibly as much as 1%3 – for our dataset, we checked each sample manually for segmentation errors, so there should be none. In both cases, we normalized the grayscale values to the training data – from 0 (white) to 255 (black) for MNIST, and -1 (white) to +1 (black) for USPS. For USPS, we adapted the blur parameter of the Mitchell downsampling filter to get the most similar grayscale histogram. For MNIST, we used the same value. We chose 100 random samples from the digits dataset and asked our students to classify them in small groups of around 2-4 people. The error rate of human classification according to this experiment is around 0.67%. As many datasets, among them USPS and MNIST, use human expertise to determine the true class of a digit, there is likely to be some class noise in all these datasets additionally to the segmentation errors which we already noticed. It should be noted that the digits were given in the format of digits (i.e. blurred and arbitrarily scaled, see Figure 4 (right)), and due to the data collection procedure there was no context around each digit. Both might have increased the human error rate. direction, the influence of blurring on the performance is reduced: Blurring helps on our small digit dataset, but has little effect on USPS or MNIST. We think that with more data, SVMs create more robust models and are therefore less influenced by blurring. However, the inability to transfer expertise over to other similar datasets is worrying and indicates that a general purpose handwritten digit recognizer is still some way in the future. The most obvious lesson from this is that for a state-ofthe-art recognizer, it is best to train it on self-collected data. Using publicly available datasets for this purpose seems to work very badly, and it is unlikely that the published error rates can be reproduced on one’s own data – as we found out. However, significant amounts of training data seem to be needed for stateof-the-art performance. Pooling datasets from multiple sources may be an option, as would be to compare with datasets where preprocessing is more comprehensively documented. We intend to address these questions in future work. The Austrian Research Institute for Artificial Intelligence is supported by the Austrian Federal Ministry of Education, Science and Culture and by the Austrian Federal Ministry for Transport, Innovation and Technology. We gratefully acknowledge the support of the students of AI Methods of Data Analysis, class 2005. References  Hastie, T., Tibshirani, R., Friedman, J.H. The Elements of Statistical Learning. July 2003, Springer, Berlin/Heidelberg. ISBN 0387952845. Y. LeCun, L. Bottou, Y. Bengio, and P. Haffner. ”Gradient-based learning applied to document recognition.” Proceedings of the IEEE, 86(11):2278-2324, November 1998. Liu, L., Nakashima, K., Sako, H., Fujisawa, H. Handwritten digit recognition: benchmarking of state-of-the-art techniques. In Pattern Recognition, 36 (2003), pp. 2271–2285. Platt, J. 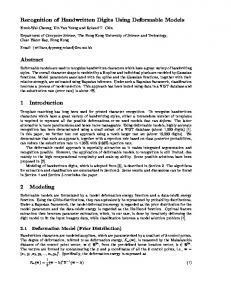 Fast Training of Support Vector Machines using Sequential Minimal Optimization. Advances in Kernel Methods - Support Vector Learning, B. Sch¨ olkopf, C. Burges, and A. Smola, eds., MIT Press, 1998. Ian H. Witten and Eibe Frank (2005) ”Data Mining: Practical machine learning tools and techniques”, 2nd Edition, Morgan Kaufmann, San Francisco, 2005. Report "Digits - A Dataset for Handwritten Digit Recognition"